As a call center agent, fielding dozens if not hundreds of calls per day, you’re faced with diversity every time you pick up the phone. Potentially fielding calls from Texas, Alaska, New York and beyond – each bringing a new opportunity to connect with customers or prospects across the nation. But are there differences, tendencies or traits in callers from different states that might be helpful as you’re picking up the phone? 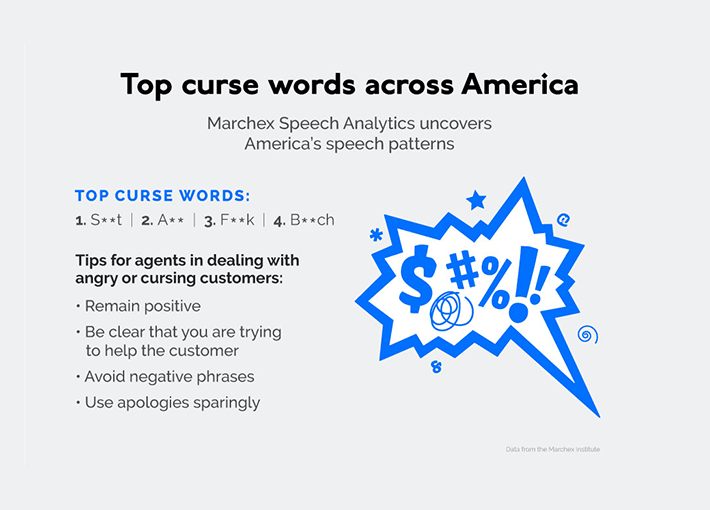 The Marchex Institute recently analyzed more than 6.8 million calls placed by consumers to businesses across the United States1, uncovering some fascinating trends in conversation patterns across America. People from Wyoming are the most talkative. 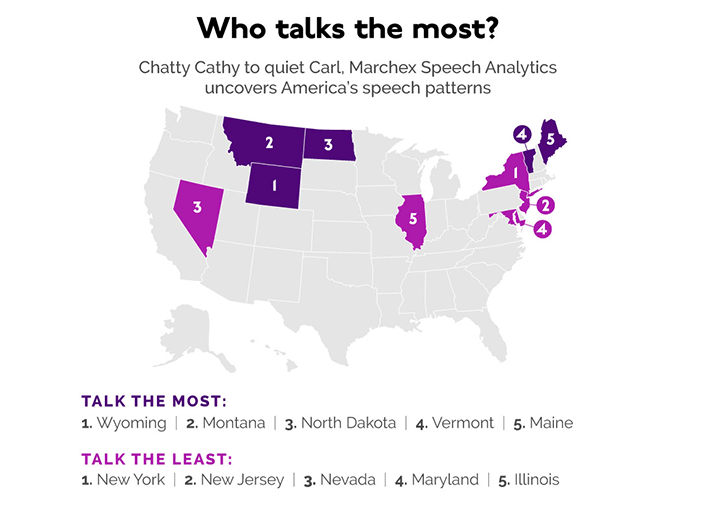 People from Wyoming topped the list for most talkative, closely followed by Montana, North Dakota, Vermont, and Maine. In fact, Wyoming residents talk 38 percent more than New Yorkers, who are the least talkative. The fastest talkers hail from the north. People from northern states including Vermont, Rhode Island, Alaska, New Jersey and New Hampshire speak the fastest, based on words per minute. On average, the fastest talkers are from Vermont, who uttered 148 words per minute, while Hawaiians uttered an average of 134 words per minute, making it the slowest speaking state. Closely following as the slowest talkers are New Mexico, Colorado, Georgia and South Carolina. Patience is lower in the Pacific Northwest. In analyzing hold-time abandon rates, Washington state and Oregon demonstrated the least patience, along with Arkansas, Kansas, and Mississippi. By contrast, residents from states in the Midwest and Northeast demonstrated the most patience, including Vermont, Delaware, Michigan, Minnesota and New Hampshire. Callers curse more in the evening. Profanity is least likely to be used before 4:00 p.m., but then the curse rate on calls doubles after 6:00 p.m., jumping from three percent to six percent. On average, callers cursed 1.1 to 1.3 times per call across the board. However, cursing becomes more common as the day progresses. “For businesses, these insights can help solve critical customer service issues by providing visibility to call center operations in real-time, which in turn helps improve the customer experience,” said Erin Murphy, analytics manager at the Marchex Institute. How can your business optimize these insights to improve the customer experience? Visibility to conversation trends helps empower your businesses to optimize valuable phone interactions with customers, including those who curse or are impatient. Stay tuned for an upcoming blog post—Tips for dealing with angry customers—to help customer service agents improve the outcome of calls. View the complete America’s Speech Patterns Uncovered Infographic or press release here. Erin has been an Analytics Manager at the Marchex Institute since May 2016. She is responsible for providing actionable insights to Marchex’s clients to help increase their conversion rates and ROI. Prior to joining the institute, Erin worked as an SEM Analyst helping local businesses improve their online marketing campaigns. Erin has a bachelor’s degree in Chemical Engineering but moved into marketing analytics five years ago.